Power distribution cables present a unique challenge to electrical wire interconnect system engineers. 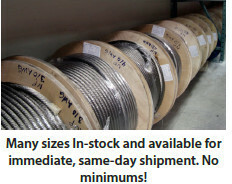 Typically fabricated from stiff, non-flexible conductors with extremely large bend radii, such cables are heavy, hard to route, and prone to jacket damage from weathering and abrasion. TurboFlex® power distribution cables are constructed from high strand-count rope lay inner conductors made with tin-, nickel- and silver-plated copper. 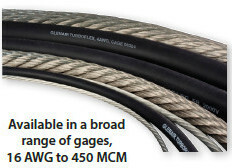 These highly-flexible conductors, combined with Glenair's high-performance jacketing result in cables ideally suited for applications where flexibility, durability, and weight reduction are required. Amazingly durable — especially in cold weather — TurboFlex cable is jacketed with Glenair's innovative Duralectric™ insulation compound that provides outstanding resistance to temperature extremes, ozone exposure, caustic chemicals including jet fuel, gamma radiation, and other forms of environmental and mechanical damage. Long life and performance are critical in power distribution applications. TurboFlex, with its flexible conductors and durable jacketing delivers both.